I'm ready do some spring fishing in shorts not heavy cloths. Decided to fish early this year for the first time, normally don't start until mid/late May. Still waiting on the Crappie to spawn up here, it'll be my first try at it. Would like to experience it this year, lets go warm weather get in the game. Re: 37 tonight,39 Sat night,34 Sun night....WTH? Supposed to snow tonight into the morning north of highway 6. Odd thing is one report says up to 1.25 inches of rain while another says 1 to 2 inches of snow. If it's cold enough to snow 1.25 inches of water could produce over 10 inches of snow! And what does local weather have to do with global warning? 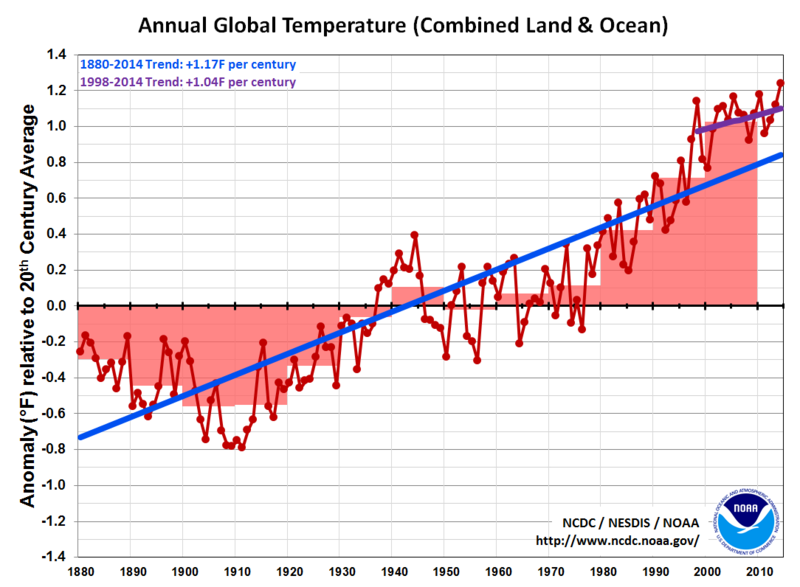 The entire global average temp does keep rising year to year. You can't argue with the data. Whos data? Oh I know whos, al gore. MR carbon footprint himself. 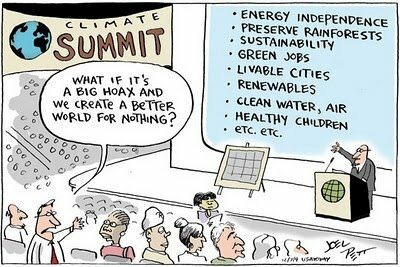 Forget about Al Gore. He's not worth of considering. He just a politician. I don't get my science from politicians. How about NASA, NOAA, and climate scientists that are experts on climate? My "Climate scientists" think differently than yours. Mine are experts also. But my data cant be bought. NOAA and NASA are controlled by who? The politicians. I do agree with climate change, look at it today. Long term the globe warms and it cools. Im sorry but I cant believe any so called data produced by government funded groups. 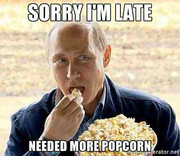 And anything the united nations says is true or is for, beware, that's a whole slew of anti United States politicians looking for some more power and money at whos expense, yours and mine. We can throw charts and quotes back and forth all day long so it comes down to who you choose to believe. You link is a politically biased BLOG page with NO scientists quoted or linked to. I can start a BLOG page that says the sky is not blue. But it doesn't make it so. And if you or NOAA or NASA start a blog and say the skys not blue most global warmers would follow right along. And those groups are not politically biased? Who or what scientists produced your chart? I put that up for the charts and graphs just like you did. A whole lot more data on that blog if your willing to look. Its what our side has to do. Since we dont fit the agenda we get the message out by the only means we have. So I will throw another one out there. One of your trusted sources NASA speaks out of 2 sides of their mouth. Which side speaks the truth? The global warming side gets covered and the cooling side does not? I dont really care what they think, as I said before NASA is a government run government funded mouthpiece of the global warmers. I just dont want the others on this sight to only see one side of the story,espically since my side is not covered by the media and the government is the perpetrator of the hoax No money or power to control in the truth. So the research that NASA and NOAA does you consider blogs? That's a new one. I guess we'll just have to disagree. My apologies if I ruffled your feathers. I agree there is climate change. That's been going on forever. What I don't believe is how much the so called experts are blaming on human causes. We haven't been keeping data long enough too start blaming us with certainty. This global warming is just a microcosm of the greater climate change that occurs on this planet. It's merely cyclical. I'm not saying it isn't true, it's all a matter of your frame of reference. However, wouldn't it be smart to try and do our best to ensure our planet can support human life for as long as we possibly can? Do you have any idea now many tons of greenhouse gases humans are releasing into the atmosphere every day? Try 38.2 billon tons. Thats a lot even for a solid. Unbelievable amount for a gas! And for those that keep repeating the fallacy that volcanoes release more: Try less than 1 percent of greenhouse gases are releases by volcanoes according to the USGS. So about 99 percent of the greenhouse gases released out there are by human activity. And just one more fallacy. Some say why should we bother when countries like China is releasing massive amount of greenhouse gases? China is in the process of shutting down their coal fired plants at last I heard the rate of 1 a week. They are also going to all renewable energy as in solar and wind. We are going backwards because our legislators can't get anything done and narrow minded thinking. You guys need to go fishing! Even if you do just paddle.